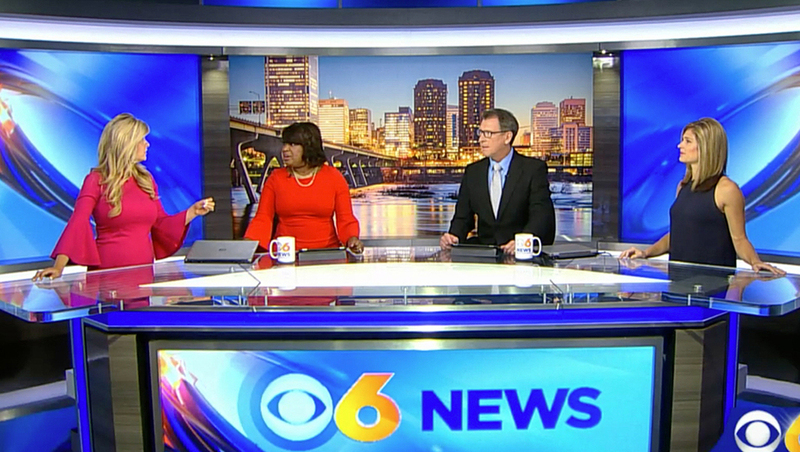 WTVR, the CBS affiliate in Richmond, Virginia, has debuted a new set. The set, which mirrors the look at select other Tribune stations, was created by Broadcast Design International. The design features a camera center duratrans flanked with two LED walls primarily used as backgrounds for anchor one shots. The entire background wraps around the rear wall of the set framed by backlit segments and a header element. The large, curved anchor desk features a glass top and integrated light bands along with an LED video ribbon on front. The technology on set was provided by Panasonic with integration by Tribune. Situated around home base, meanwhile, is a touchscreen area next to a faux stone column. Next to this is a three wall multipurpose area with backlit panels and stacked stone knee wall. Although outfitted with three flatscreens, the area can be shot with all three, just two or even only one panel. On the other side of the studio is a nine-panel video array used for weather and standups as well as the weather center itself, which features backlit walls and a variety of panels in addition to functional workspace.